I've never played either Tennis or Table Tennis. And maybe many of you haven't played too. Today I'm gonna share a Table Tennis game with you. It's a very attracting game. For last few days I've been playing this continuously. And hopefully you will find it interesting too . . . It's a flash game. So it will work with any running version of Windows. Whether you're using Windows 98, XP or 10 it doesn't matter. 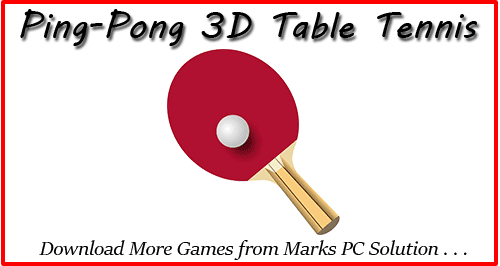 Download Ping-Pong 3D from this link. It's 100% free - no adware or malware. Now unzip the folder and double click on Table Tennis.exe to run the game. 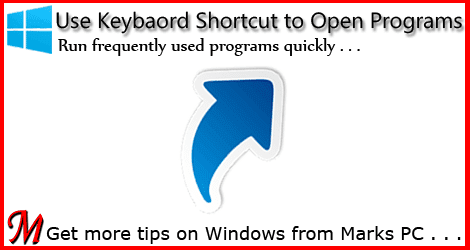 Click on the maximize button to play in full window. Choose your difficultly level from Easy, Medium & Hard. Hit on the new button to start playing. Move your bat through mouse and defend the computer. Hit the ball by the right side of the bat to shot on the right. Hit the ball by the left side of the bat to shot on the left. Be patient, don't be hurry. Or you will lose points frequently. 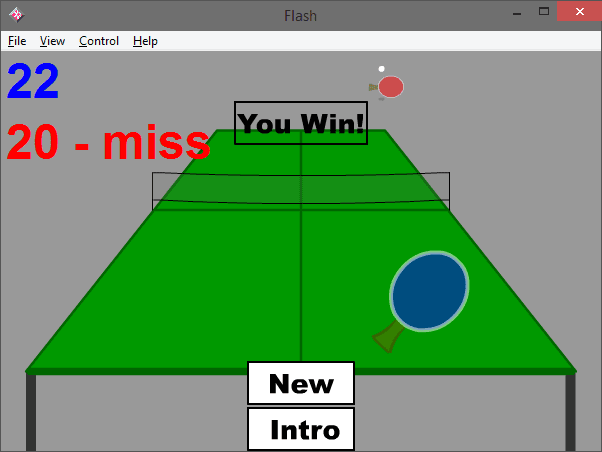 When you or computer miss the ball or shot outside of the table, you have to click the serve button to continue the game. Those who scores 21 points earlier, will be the winner. But he must have 2 points more than that of losing party. Without sufficient practice, this game is quite difficult. I've been able to defeat the computer in easy and medium level. In hard level, I haven't got a single victory yet. But I'm trying hard. It was medium level difficulty. And in order to win, I had to score 22. Because when I was at 21, the computer was at 20. But according to rules, the winning side has to score 2 points more. That's why I had to score 22 to get the victory. Hope all of you will enjoy playing this game. Why do you late?? Download the game now and start playing . . .
Today I'm gonna share a 20-year old game with you - Clickomania! 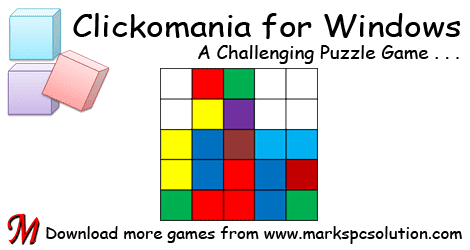 It's a challenging puzzle game for Windows. Maybe many of you have played this game earlier. But it's a very old game and the new users are busy with latest games. 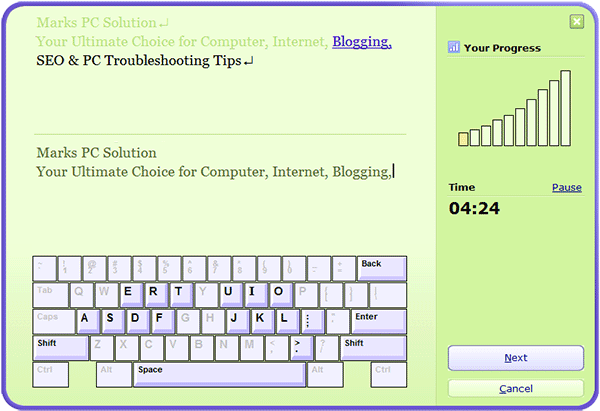 That's why I would like to share this tiny game with the visitors of Marks PC Solution. I believe you will enjoy the game . 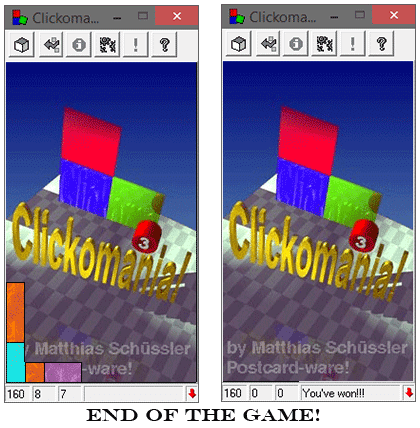 . .
As mentioned at the beginning, Clickomania is almost a 20-year old game. This game was released when Windows 95 and 98 were leading the computer world. But it still works with the latest version of Windows Operating Systems - Windows 7, 8 and 10. Download the Clickomania from this link. It's in zipped condition and you've to unzip it first. Open the extracted folder and double click on CLICK.EXE to run the game. Take a Look at the Interface . . .
New Game: If you click on this, a new game will open. And the new game will start with different colors. Undo (Ctrl+Z): This is actually the cheat option. If you hit this button, you can undo the last move you've made. Statistics: Hitting on this button will show the statistics window. Configuration: If you hit this button, you will get the configuration window. You can change the game's settings from this option. About: This will show you the game developer's information. Help: Help option has been removed from portable version. You can't use this one. Instructions - Really easy to play . . .
You have to uncover the background by removing all the boxes. A single box can't be clicked. There must be at least two boxes which are either horizontally or vertically arranged to be clicked or removed. You've be strategic enough to clear all the boxes. 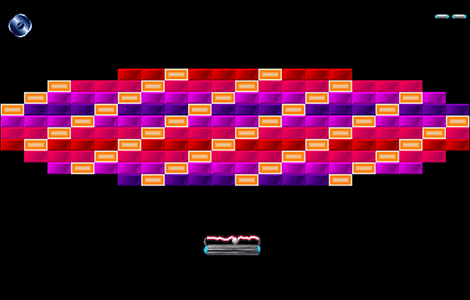 At the end of the game, if there are boxes left without combination of similar boxes, the game will be over without achieving the target. Share your Performance with Us . . . I've played this game for more than 100 times so far. But I've been able to clear all the boxes only 4/5 times. It depends on luck also. If you're able to achieve the target, please share with us. Or if you have any query, leave a comment below . . .
To be honest, I was really surprised. 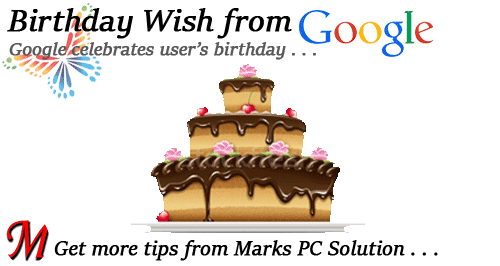 Because this is the first time I've ever experienced birthday wish from Google. And I was more surprised when it comes in the form of doodle. Most of you are familiar with Google doodles. They usually appear in Google homepage to celebrate different occasions. Such as World Cup, Christmas Day, Valentine's Day etc. 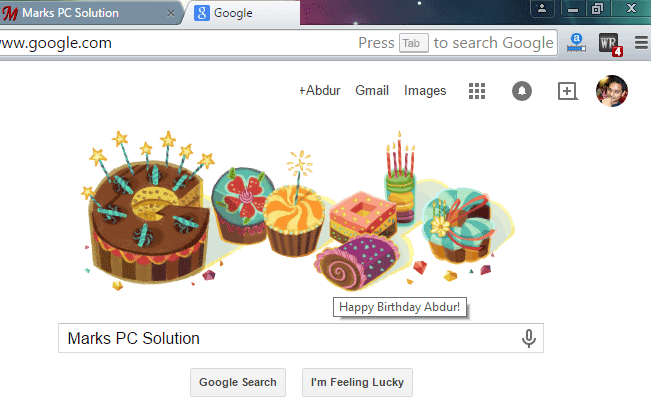 And if you're a Google Plus profile owner, Google will celebrate your birthday too! You must have a Gmail ID with Google Plus enabled. Your date of birth must be there. You must be signed into Google on your birthday. Okay guys, no more writing today. I need to take rest now . . . I'm gonna share an old game which was first time released around 20 years ago. DX-Ball is a very simple game and also small in size. But it's still challenging. Without enough practice, you can't pass more than few levels. Believe me - every level is full of excitements! 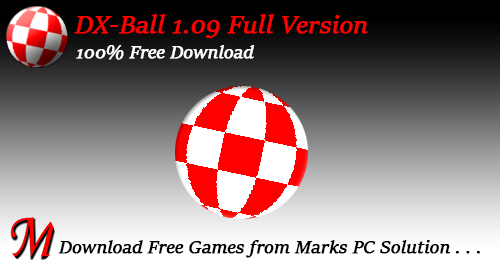 DX-Ball 1.09 works with all running version of Windows (Including Windows 98). There is no other special requirements. It's in zipped condition. Unzip it. Now open the folder and double click on DX-Ball 1.09.EXE to start installing. Now find the DXBall icon either from your Desktop or Start Menu and click twice on it. The game will open immediately. Click left mouse button to proceed. Enjoy! After starting the game, an initial screen will appear. Click left mouse button to proceed. Now another screen will appear containing some signs. 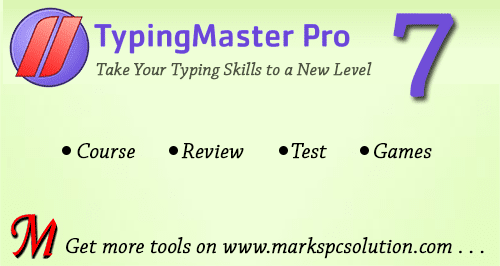 These are very important for you to play the game properly. Try to memorize the meaning of each button. Click left mouse button again to proceed to the game. You've to click left mouse button to release the ball. The ball will hit the boxes and return to the base. And you've to catch the ball through paddle. If you fail, you will lose a life. You've total 3 chances. Always focus on the movement of the ball and move your paddle through mouse. While the ball hitting the boxes, some boxes will be coming down. Pick the boxes that are necessary. Red boxes are usually harmful. Get their meaning clearly, before playing the game. To exit the game, press Esc twice or press Alt+F4. I'm sure you'll enjoy the game. And don't forget to share how many levels you've managed to overcome . . .
Every time when I need any help regarding my Payoneer account, I take the help of support center. And it's really helpful. When I request something, the support team try their best to do this. Today I would like to share my experience with you. After reading this post, you will understand how supportive the Payoneer team is. You must have an account in Payoneer to get supports. And you must be signed in there. Live chat and phone call may not be active always. You will get the proper contact time in the support page. Case 1: $65 has been Stolen from My Card (Recovered)! For the first time, I met Payoneer Support Center when I lost $60 from my prepaid master card. In that time, I've little experience. I was not conscious about security measures. Actually it was my mistake. I just wrote a review on Payoneer Master Card and made the funniest mistake of my life. As specimen, I scanned my card and used it in my post. It was clearly showing my card number and expiry date! And the culprit (Sorry to mention that, maybe he is my blog reader) was so clever. Probably he understood that it is the picture of an active card. Though it was empty that time. I've no idea that in case of online transaction, PIN is not required. Only card number and expiry date is enough to pay the bills. When my card was loaded, I've lost $60 (30 + 30). In that time, I didn't understand what is this! Later I've lost $5 more. Then I've realized the fact. Someone has clarified me the issue and advised to contact Payoneer. As advised, I've contacted the Payoneer Support Team through Live Chat. I've clarified the fact to them and requested to block the card immediately. They suggest me to file a case reporting the issue through proper form. They also informed that I can't apply for an amount which is less than $20. So I just applied for $60. And within few weeks, they returned me the money in my card! I was just surprised! How did they manage it?! After blocking the first one, I applied for a replacement card. Don't know why it was taking more than 4 weeks. I thought, something was wrong that's why the card may not reach my post office. Then I applied for another card. Just two days after applying for the second replacement card, the first one reached my post office. And by this time, it was blocked by Payoneer support team for issuing me the second one! What should I do now? Again I took help from support team. I've told them details. Then they unblocked the first replacement card and blocked the second one. And I just had to pay the replacement fee for one card - $12.95. Case 3: Money Sent to the Wrong Person (Recovered)!!! Believe it or not, only few days ago, 360 Advertisement, paid me $214 via Payoneer. Unfortunately I didn't get the money. Know why? Because the sender (+Anzaq ali) sent the money to the wrong person. In the list, he just selected the wrong account. And $214 went to the wrong person who was not supposed to get a single dollar! When I informed Anzaq Ali that I haven't got the money yet, then he checked and found that the money has been sent to the wrong person. Immediately he contacted the Payoneer Support Team. Anzaq Ali also requested that person to send the money back but he denied. I must say, Anzaq is lucky enough. The person who got the money by mistake, he made another mistake. He didn't withdraw the money thinking that it's now in my account - nobody can take it back. But Payoneer has returned the money to Anzaq within 2/3 days! What can I say more? I'm really satisfied with their service. If you have anything to share about Payoneer, just leave a message in the comment box . . .
As declared earlier, finally, Google Talk has been terminated by Google. It's no longer supported on Windows. Google is trying to force the users to use its Hangouts app. But I've found no logical reason behind shutting down this lovely app! 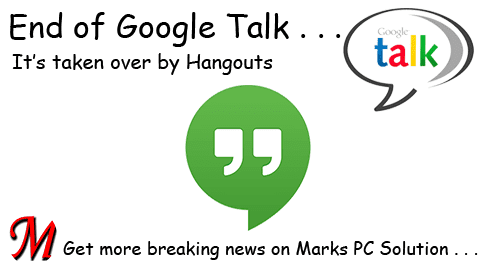 I was just waiting to see the end of Google Talk on February 16, 2015. But even after February 16, Google Talk was working fine. From another source, I came to know that it will be stopped on February 23. But it was working after February 23. I think many other Google Talk users have got the same message from Google. But don't know how many of them are real user of it. 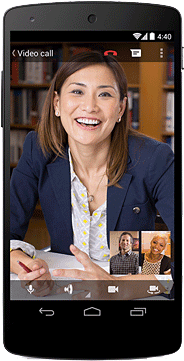 In most cases, I used to contact my friends, visitors, classmates and other people through Google Talk. But now I have to keep my Gmail window open to chat with them. What to Say about Hangouts . . .
My experience with Hangouts is not good at all. In my 150 kbps connection speed, I had never been able to connect Hangouts through Chrome. It needs at least 300 kbps speed to connect to the service! But I have to say that Hangouts looks better than Google Talk. Google Talk was simply an instant messaging service. It was simply 1 MB in size with very simple messaging options. But with hangout, you can do lots of things. You can share photos and emoticons in Hangouts, make audio and video calls etc. You can also draw something there. But it doesn't allow to share files like Google Talk. Maybe Google wants the users to communicate through single app - Hangouts. 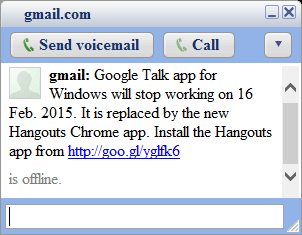 That's why Google has finally turned off Google Talk through a long process . . .